Making dosas takes some practice but it’s a lot of fun. One of the best parts of writing a curry blog is all of the great people I have met along the way. Many readers of my blog ask me where I get all my recipes. Most are either made up by me, sent to me by email or taught to me. I love learning from top chefs. Being as passionate about Indian food as I am, it has helped me continue writing this blog. One of the most memorable days out I had was when I was invited to Prashad to learn a few of their recipes and cooking techniques. For those of you who are unfamiliar with Prashad, they were the surprise stars of Gordon Ramsay’s Best restaurant TV show in 2010. Prashad is a vegetarian restaurant and I promise you Gordon got it right. Even if you are a meat fan like me, you won’t miss it. Their food is second to none. If you are interested in learning some of their recipes, be sure to check out ‘PRASHAD – Indian Vegetarian Cooking’ by Kaushy Patel. You can look inside the book on Amazon here. I have also written a review which you can read here. While I was there, I got to work along side Minal Patel who is Prashad’s head chef. She showed me how to make dosas among other things. My family are dosa crazy so I couldn’t wait to get home and make the recipe. The first attempt was a great success! We enjoyed a dosa evening together and looked forward to making them again for friends. The second go – this time with a house full of hungry guests was a bit of an embarrassment. The batter clumped up when I tried to cook the dosas like large curd cottage cheese. Luckily we had some naan dough at the ready so no one went hungry but it was a disappointment. I thought maybe it was a problem with the batter and I received many suggestions about how to make a better batter. I knew, however there was no beating the batter I’d learned at Prashad so I tried a few more times with limited success. I’ve since learned that the pan was too hot. 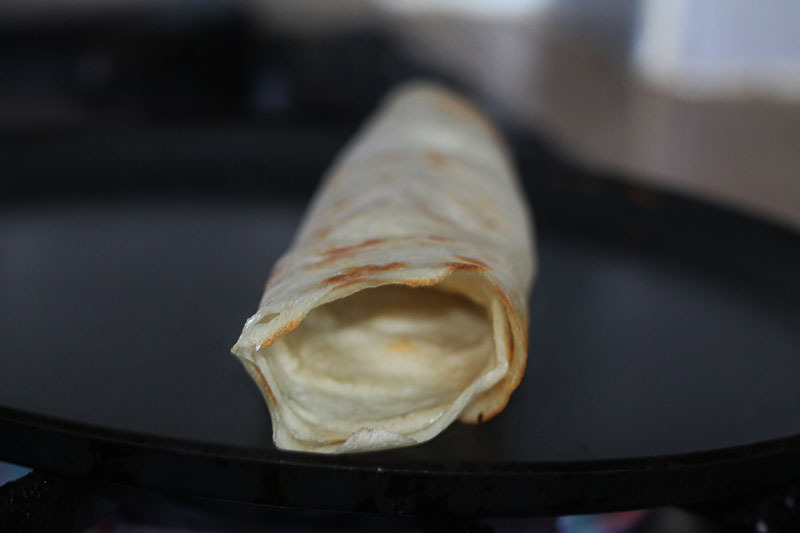 You don’t need a lot of heat to make dosas. Keep the heat to a minimum and this recipe will work for you every time. In Kaushy’s cookbook, she recommends using broken rice which was broken during harvest or while drying. 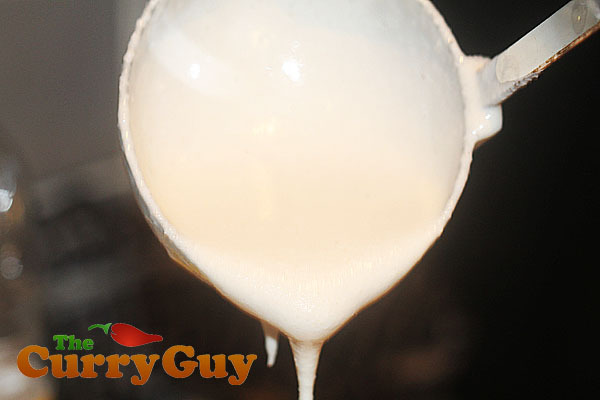 It is starchier and perfect for making a dosa batter. You can purchase broken rice at Asian grocers. If you can’t find it, just use normal Basmati rice. By the way, I’ve changed my recipe ever so slightly while experimenting. It worked very well! If you want to try Kaushy’s version exactly, be sure to get a copy of Prashad for yourself. You’ll be glad you did. The batter should be smooth and and about the same consistency as whisked double cream. Insider trick. 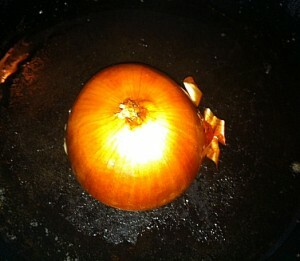 Chop an onion in half and wipe it on the surface each time before pouring the batter. It help ensure the dosa doesn’t stick and adds to the flavour. Pour about 150ml of batter onto your pan and then, working quickly from the centre, spread it out in a circular motion using the back side of your ladle. As the batter cooks, the sides will crisp up and become brown. At this stage, pour a little oil around the edges. Fold the sides in and turn with the seam side down. Combine the rice, lentils and fenugreek seeds in a large bowl and rinse three times with water. Pour enough warm water into the bowl to cover and soak for 12 hours or overnight. When ready to make your batter, drain the water. Place half of the rice mixture into a food processor with about 100ml of water and blend for at least five minutes until very smooth. You do not want to rush this. It is an essential part of making the batter. Repeat with the rest of the rice mixture adding another 100ml of water. Combine the two batters and add the salt and sugar. Whisk thoroughly. Now place the batter in a air-tight container and leave in the fridge to ferment for 24 hours. When ready to cook, place a non-stick - or normal frying pan over low heat. The pan is ready when a drop of water sizzles away almost immediately. Using a ladle, pour about 150ml of batter into the centre of the pan. Then working very quickly and working from the centre, take the bottom of your ladle and move the batter in circular motions outward so that it is flat and not thick. Turn the heat up a little. 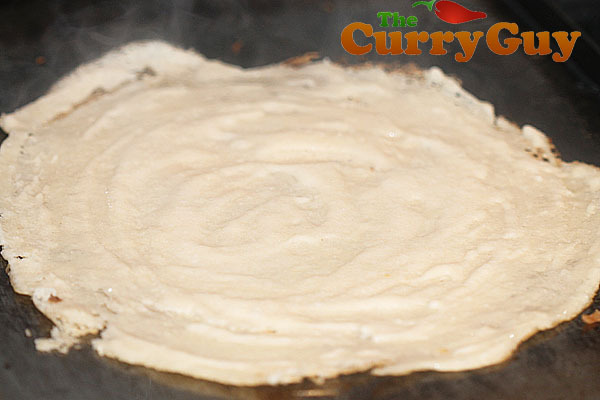 The sides of the dosa will begin to brown and move away from the pan after a few minutes. 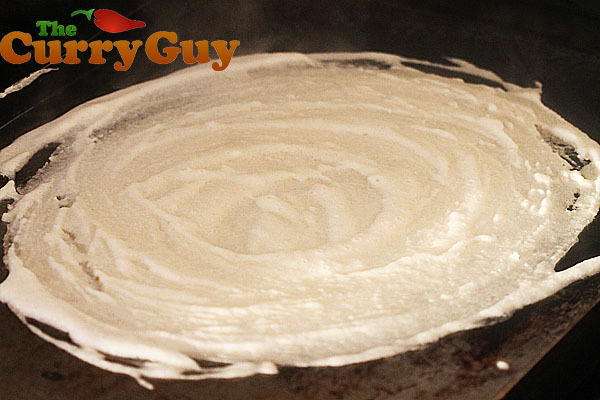 When this happens, trickle about ½ tablespoon of the oil around the edges of the dosa. YOU NEED TO START THIS RECIPE AT LEAST 32 HOURS BEFORE SERVING. If the batter becomes clumpy, turn down the heat and allow the pan to cool a little. East End Foods Sponsors my blog. I highly recommend their lentils and rice. Hi Dan, I’m really looking forward to making these for the first time this weekend. Can you clear up the part where we drizzle the oil please? 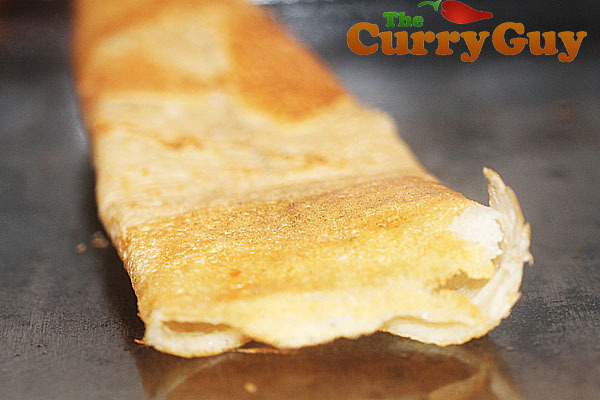 Does the oil go onto the surface of the dosa, or does it go onto the pan and underneath the edges of dosa? Also, what is the purpose of this, what are we trying to achieve? Thanks for your time with this and thanks for a great website! The oil isn’t really necessary but I like to use it. Drizzle a little around the edges right before you flip them over the first time. This will make the edges of the dosa nice and crispy. Do you need to use mineral water? Or at least, tap water that’s stood for 24 hour to de-chorinate it? The fermentation seems to use natural yeasts, and I have found when I make fermented vegetables and sourdough bread that tapwater kills it. These days I stick to carbonated mineral water. Thank you. To be honest I’ve never considered that option. Will give it a try. I use tap water and it ferments really well. I guess it depends on where you are in the world. Some places I would only use bottled water. Will give your idea a try. I’ll be interested to know how it goes. In Sussex our tap water seems quite heavily chlorinated. Also, as I have both urad flour (for pakoras and bhajis) and rice flour, is there any reason why I should not just use these (with fenugreek of course)? I’ve used flour for dosas but prefer the flavour when it is made from rice and urad lentils. Give it a try though. If your water is heavily chlorinated, I think you should definitely go for bottled water! Thank you very much for that tip! I’ve never heard that before. I’m going to try it. Must i use Maldon sea salt or any sea salt is okey? Any salt will do. I like Maldon as it is flaky and not as salty as normal table salt. Just add salt to taste as you won’t need as much. Are you supposed to flip the Dosa over? The instructions don’t mention it, but in one of your comments it sounds like you flip it more than once. Please clarify. I cannot wait to try this! Thank you. Thanks for getting in touch. No, don’t flip the dosa. You only need to cook it on one side as it cooks through anyway.